UNITED NATIONS, July 18 -- Those opposing a declaration of indigenous people's rights include Russia, it emerged Wednesday at the UN. 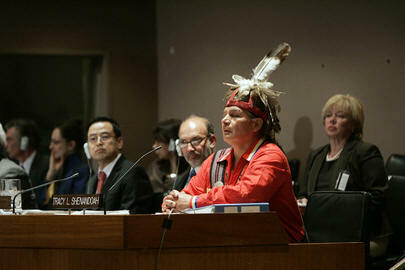 The chairperson of the Indigenous People's Caucus, Les Malezer, told reporters that at a meeting two weeks ago about the twice-stalled rights declaration, Russia asked that the indigenous be removed from the room, and then argued for changes to the draft. Malezer also named Russia as the one country that now says there should be no vote on the draft during the current General Assembly session, ending September 17. Video here. While some in the African Group argue that there are no indigenous people in their countries, in Russia there are, for example, those in Chukotka, Yakutia and Chukchi. In 1992, the Russian government called for the rapid development and passage of a law on "clan, obshchina and family lands" for aboriginal groups (Ob uporyadochenii 1992). Eight months later, the Sakha Republic adopted a statute on "nomadic clan and clan-tribal obshchinas" edict (O kochevoy 1992). So why now the opposition to a declaration of indigenous rights? Observer say it comes down to natural resources. Others now pressing for re-drafting of the declaration, which already passed the UN Human Rights Council in Geneva, include Canada, Australia, New Zealand, Suriname, Guyana, Colombia and at least some members of the African Group. South Africa, for one, voted for the draft in Geneva. Could it vote against the same document in New York? That remains to be seen. Inner City Press asked Malezer if Ban Ki-moon has been helpful in pushing for enactment of a UN rights declaration for the indigenous. The previous Secretary-General was, Malezer answered, diplomatically in the house of diplomacy. That is, Ban was missing-in-action (MIA).